Maqbool Fida Husain (17 September 1915 – 9 June 2011) Urdu: مقبول فدا حسین ) commonly known as MF Husain, was a modern Indian painter. He was a founding member of The Progressive Artists Group of Bombay (PAG). He is thought to be one of the greatest painters of India. 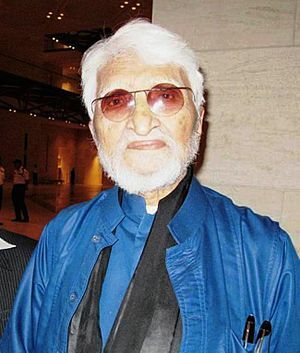 M. F. Husain died, aged 95, on 9 June 2011, following a heart attack. He had been unwell for several months. He died at the Royal Brompton Hospital in London, and was buried in Brookwood Cemetery on 10 June 2011. M. F. Husain Facts for Kids. Kiddle Encyclopedia.